How to use Xlog on framework trunk? Hi all, I was checkout svn framework trunk and i creating my plugin. But i can't call Xlog object. 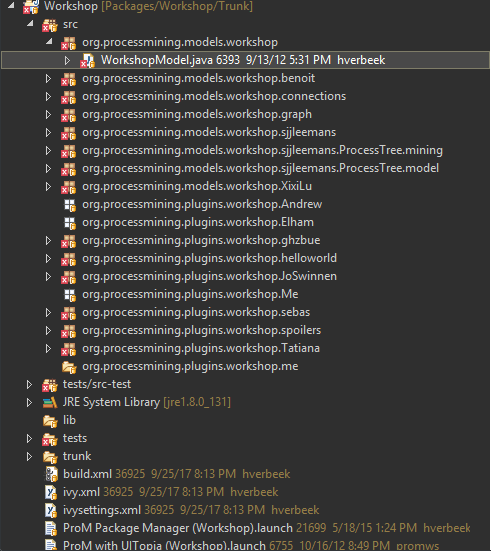 Please checkout ProM from the Workshop package, that is, from https://svn.win.tue.nl/repos/prom/Packages/Workshop/Trunk. The framework trunk is not being maintained anymore. I checked out that, but too many error with import. Can you help me? Do you have the IvyDE add-on installed in Eclipse? You need this add-on to resolve dependencies on other packages and on external libraries. See also https://svn.win.tue.nl/trac/prom/wiki/Contribute. Thank you so much. I'm starting create my plugin.